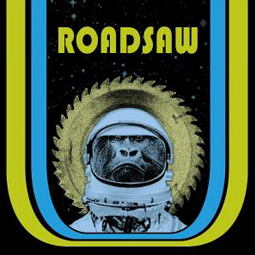 As they ready for the release of their newly minted self titled record on the Small Stone label , ROADSAW make one thing perfectly clear. Their sound is as searing and sleazy today as it was when they rose from the blue blood streets of Boston 18 years ago. For the unfamiliar, ROADSAW, delivers its listeners an audio map thru the amplified analog landscape of 70’s FM rock radio. From the shores of British electric blues, through the Southern Rock swamps and into heart of California’s psychedelic desert , ROADSAW’s long strange trip is a virtual history of heavy riffs. With every tour, every new record, ROADSAW’s fans and freinds kept coming back for more. On the road, they’ve shared stages big and small on both sides of the Atlantic with comrades like Orange Goblin, Fu Manchu, Queens Of The Stone Age, Nebula, Scissorfight, Karma To Burn, Black Label Society and many others. ROADSAW have also been regular guests at CMJ and SXSW events and played every “Metal” or “Stoner” festival that would have them. Over the years ROADSAW continued to add to their impressive resume which included five full lengths, a dozen of singles and a slew of covers and one-offs for numerous compilations. Their third album, 1998’s epic double disc “Rawk N Roll” is considered by many to be their most popular and well crafted offering to date. 2010’s version of the band is built around the core of ROADSAW’s classic “Rawk N Roll” line up. Still leading the charge is veteran guitarist Ian Ross, and original members Tim Catz and Craig Riggs on bass and vocals. Newest member drummer Jeremy Hemond provides the heavy hand required to propel this smoking engine forward. This spring ROADSAW will be releasing a new collection of heavy gems. For their sixth full length release ( their second on the Small Stone imprint ) the band called upon long time associate and legendary producer Sean Slade. Known mostly for his work with Indie stars The Pixies, Radiohead and Dinosaur Jr., Slade also possesses a record collectors mind and love for all things loud. When he asked if he could dust off the 24 track Studer tape deck in the corner of the studio and record the new tracks to two inch analog tape, ROADSAW knew they had their man. With Mad Oak Studio wiz-kid Benny Grotto twisting the knobs and Slade’s sagely guidance, ROADSAW laid down their most potent record to date. Songs like ” Dead And Buried”, ” So Low Down” and “Weight In Gold” bear the red-hot ROADSAW brand with a new found urgency and conviction. Next on the calendar is a record release party scheduled in March at Austin’s SXSW and US / European tours to follow. Looks like 2011 could be one of ROADSAW’s best years yet. Engineered and Mixed by Benny Grotto. Recorded at Mad Oak Studios – Allston, MA. Mastered by Dave Collins at Collins Audio – Los Angeles , CA. Artwork/ Layout by Ian Adams. All songs written by Roadsaw / BMI Shot From A Cannon Music 2011.